It’s perhaps not the best of mornings, with thoughts of yesterday’s Sandy Hook memorial service fresh in our minds. Mayor Bloomberg spoke on national television yesterday about gun control. Also on the safety front, he was accused yesterday of developing a stealth plan to ban smoking in people’s homes, a claim the city staunchly denies. As for SantaCon, we might have picked up the pieces, but we’re still tweeting about it. And out with the old, in with the new: with bistro Lina Frey already a distant memory, the Lobster Joint finally opened on East Houston. Stephen Rex Brown Damaso Vigo takes a defiant puff. As you probably heard, smoking is now banned in city parks and beaches. 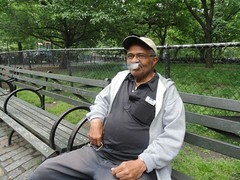 The Local stopped by Tompkins Square Park to see if East Village smokers were following the letter of the law. The first thing we saw upon entering the park at St. Marks Place? That’s right, a smoking scofflaw. 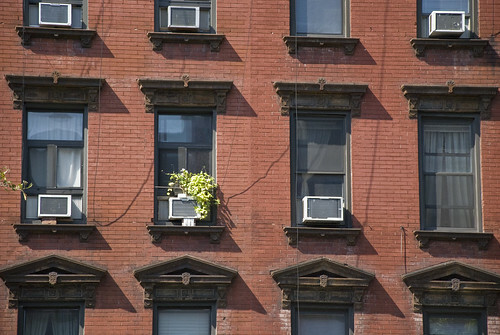 The new law was hailed by Mayor Michael R. Bloomberg as an important measure to protect locals’ lungs. 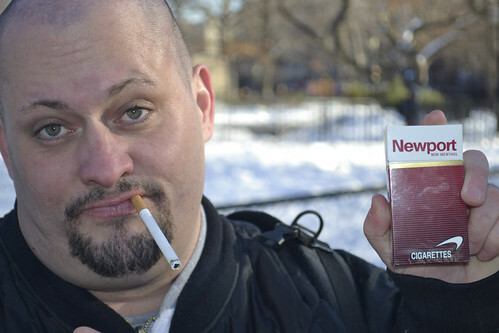 But even some non-smokers in Tompkins Square Park were uneasy with the nix on nicotine in parks. 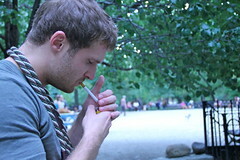 Mark Riffee The city’s expanded smoking ban applies to city parks, including Tompkins Square Park where these smokers were lighting up. But no worries. If Mr. Bloomberg signs the bill as expected, East Villagers will be able to enjoy the sanctuary of Tompkins Square Park this summer – safe in the knowledge that they can sit on a bench and talk for hours on cell phones, bang on bongos until sundown, or practice their scales on a tuneless guitar while others are trying to read – without even a wisp of silent smoke to poison their cacophonous idylls. And if smokers do wish to smoke, they may leave the park, as if it were an unusually large restaurant, and indulge themselves on the periphery. In time, the subsequent clotting and befouling of the sidewalks around the park might understandably irritate pedestrians, thus leading to a new ban. Eventually, smokers may be forced to take their chances and light up in the middle of the road. It is undeniable that smoking is harmful to one’s health and there is ample evidence that smokers can indeed quit. Well, at least some of them can. Perhaps even most. But certainly not all. Certain stubborn souls just can’t, or won’t, shake the habit. Then there are schizophrenics, the bipolar types, the deeply depressed, and others to whom cigarettes are a crucial crutch. Mark Riffee City Council voted Wednesday to extend the smoking ban to parks and beaches. Jon Goldstein, an East Village tattoo artist, thinks the law was passed in order to make money from fines. No smoking allowed in New York City’s 1,700 parks or along the city’s 14 miles of beaches, said the City Council on Wednesday. The measure passed by 36-to-12 after a bitter debate over government authority versus individual liberties. 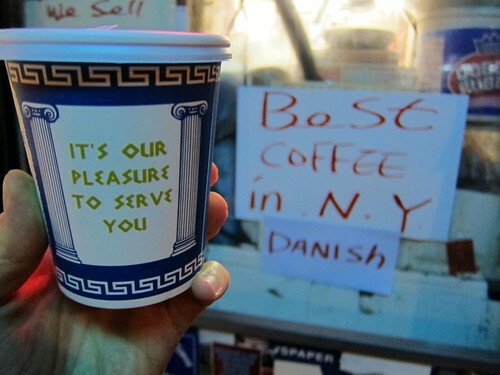 So what do you think, East Village? Smoking is allowed here – that was the message Community Board 3 sent to anti-smoking groups Thursday night by refusing to endorse legislation that would broaden the city’s ban on smoking in public. Staff from the American Lung Association in New York and Asian Americans for Equality asked the board for a resolution supporting City Councilwoman Gale Brewer’s proposed expansion of the smoking ban. In their request, the anti-smoking groups cited the high rates of smoking in the district: 18.3 percent vs. 15.6 percent citywide. Councilwoman Brewer’s proposal would extend the existing ban at restaurants and bars to such outdoor locations as parks and beaches. The resolution from the board would have largely been a symbolic gesture: it would indicate to City Council that the district’s leadership supported the legislation. But when asked if they wanted to make a motion, board members were conspicuously silent. A motion must be made before a vote on a resolution can take place: no motion, no resolution. Still, Lisa Spitzner, of the American Lung Association in New York, remained optimistic, saying that one of the group’s main goals Thursday night was to get the word out to the community about smoking cessation programs. “This is the best way to do it,” she said. What do you think about the plan to extend the smoking ban? The State Liquor Authority Committee and Department of Consumer Affairs Licensing Committee for Community Board 3 met for three hours Monday night and the discussion centered on two of the neighborhood’s hot-button issues: the granting of liquor licenses and noise complaints. NYU Journalism’s Molly O’Toole reports that many of the roughly 30 people who attended the meeting asked committee members about whether more restrictions should be placed on provisions for transferring liquor licenses from one business to another. Currently, the holders of liquor licenses may sell them like any other asset. And Ms. O’Toole reports that Susan Stetzer, the district manager of Community Board 3, said that landlords — and previous owners — are using the lure of those licenses to demand high selling prices and higher rent for incoming tenants who want to open businesses that sell alcohol. Under the current rules, new tenants in that situation can immediately acquire a temporary license and begin operating. “Transfers is the single issue that has this committee and our community in its vice grips,” one resident said, noting the public opposition last week to the granting of a license to Table 12, a diner on Avenue A.
Ms. O’Toole also reports that some residents believe that the high volume of noise complaints in the neighborhood — 2,324 complaints have been called in to the 311 hotline for city services as of June, the most from any community board district in the city – may be partly attributed to the city’s smoking ban in restaurants. Smokers, who go outside to light up, are sometimes the source of noise complaints. “The community is paying for what Bloomberg should have thought out,” said David Mulkins, a frequent critic of licensing rules who lives on East Fifth Street near Second Avenue. 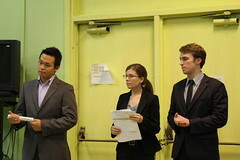 Mr. Mulkins directed his ire at Mayor Michael R. Bloomberg, who recently proposed broadening the smoking ban. Peter Bradley, another resident of East Fifth, expressed frustration that not enough was being done to address the concerns of community members. We’d also like to remind you that residents will have another chance to be heard when Community Board 3 holds a full board meeting tonight at 6:30 at P.S. 20, 166 Essex Street (between East Houston and Stanton Streets). Besides issues related to alcohol, EV Grieve notes that the board may also consider a measure to limit the number of concerts in Tompkins Square Park. 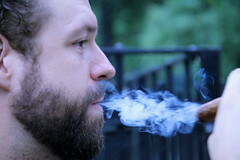 Stephen Harausz Christopher Thomasson enjoys a smoke in Tompkins Square Park. Smokers in the East Village have gotten used to being a drag on society. They cried tyranny eight years ago, when the Health Department banished them from bars and restaurants. They vowed to quit when recent taxes pushed the price of a pack near $15. Now City Hall wants to ban them from parks, beaches, boardwalks and pedestrian plazas. So how does the proposal strike denizens of Tompkins Square, the only major park in the neighborhood? Judging from a random Sunday afternoon sampling of smokers and non-smokers, the diverse crowd has its reservations.